Tickets for 2019 have now Sold Out. There will be a resale of any returned coach packages on Thursday 25th April followed by a general admission resale on Sunday 28th April. Anyone wishing to buy a Glastonbury 2019 ticket will need to have registered. Register online at www.glastonburyregistration.co.uk. 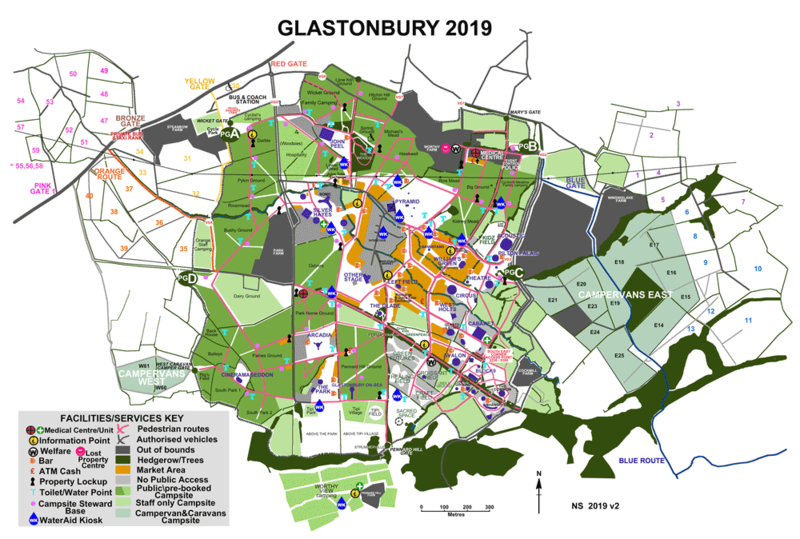 These pages aim to give you all the information you need about Glastonbury Festival: from ticket information and travel advice to suggestions for what to bring. If you’re staying at Worthy View, click here. On site, during the Festival the Information Points are a veritable fount of knowledge and home of usefulness. If you’re not sure where to begin, a lot of people seem to head for the pages about tickets, getting here and camping. The 2019 Festival Map is below (click for full-size version).